GORE® Joint Sealant can be used in practically every type of sealing application. 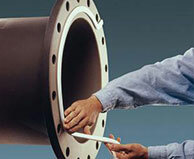 This form-in-place gasketing is a reliable sealing solution for large, complex, or damaged flanges. Installation is easy – just peel off the adhesive backing, apply to the surface, and overlap the ends. GORE® Joint Sealant minimizes the potential for leaks, process disruption, and lost production. It also reduces maintenance time, safety risks, and the possibility of catastrophic failure. Resistant to all media 0-14 pH, except molten alkali metals and elemental fluorine.